A standalone contemporary novel in the Porthkennack universe. This is a wonderful treat for the soul. As with all of the best books by Garrett Leigh, there is a magical sense of place in this story and the characters are complicated and perfectly flawed. Kim is an artist who is rebuilding his life and struggling to stay dry. And while this description makes him sound dark and angsty, he also has a playful, almost joyful side that made me fall hard for him. Jas escapes to Cornwall after relationship breakup in London. He is heartbroken, demoralized, and trying to find his place back with his family. A photographer, he shares a creative passion with Kim. I loved watching these two find each other as they both rebuild their lives. Two damaged men make for a complicated and often difficult relationship but these two work. They complement each other pretty perfectly. As always, I love Garrett Leigh’s England as much as her characters. I love the tiny details that make an artisanal festival come to life perfectly. I love the snippets of conversation that make characters feel immediately real and familiar. I love the way the author brings the whole community to life and not just her central characters. The writing in this story is really beautiful and this might just be the best Porthkennack book yet. Garrett Leigh is a British writer and book designer, currently working for Dreamspinner Press, Loose Id, Riptide Publishing, and Black Jazz Press. Her protagonists will always be tortured, crippled, broken, and deeply flawed. Throw in a tale of enduring true love, some stubbly facial hair, and a bunch of tattoos, and you’ve got yourself a Garrett special. Garrett also works as a freelance cover artist for various publishing houses and independent authors. For cover art info, please visit blackjazzdesign.com. 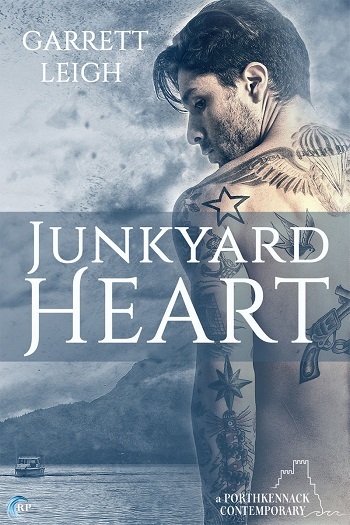 Reviewers on the Wicked Reads Review Team were provided a free copy of Junkyard Heart (Porthkennack #7) by Garrett Leigh to read and review.